Is a Goberian Right for Me? One of the biggest decisions a future dog owner will ever make is regarding what type of a dog to get. It is a lot more complex than what one might think at first, as there are countless aspects to consider when trying to decide what dog is the right fit for you. 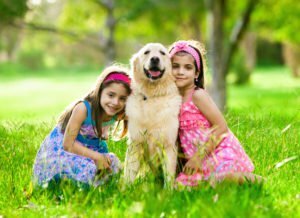 Most people have heard of the Golden Retriever – the perfect family dog that tends to get along great with children has an even temperament and a goofy personality. They are loved by countless people worldwide, and their popularity shows no indication of wearing off. Many are also familiar with the Siberian Husky – a highly intelligent, energetic and loyal dog, often used for Mushing and high-performance canine activities. 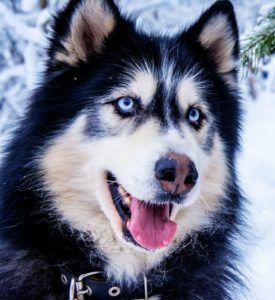 Now, while familiar with these two breeds, few have ever heard of the Goberian dog – an exciting new designer mix, where a Golden Retriever makes up one half of it, and a Siberian Husky the other. The somewhat unexpected mix between Golden Retrievers and Siberian Huskies are often called ‘Goberians’ (Golden + Siberian), and they are slowly becoming more and more known in the wonderful dogs’ world of cross breeds and pedigree dog breeds. 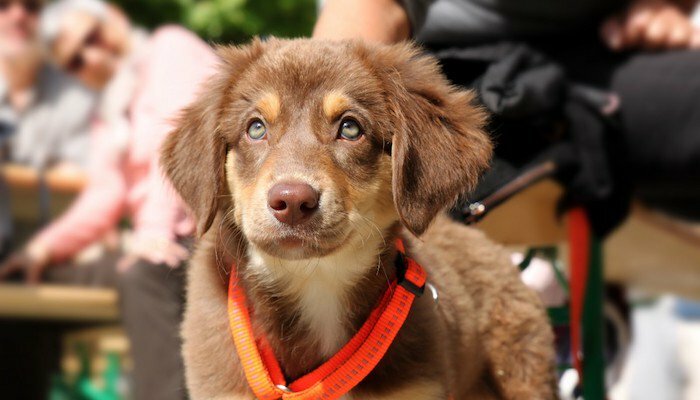 This Husky Golden Retriever mix is considered a designer mix; where two separate breeds have been crossed successfully, resulting in a type of smart dog that people are interested in obtaining. The difference between a designer mix and a regular mix breed is that these aren’t accidental or crossed “just for fun,” but instead they are carefully calculated mixes to bring out certain qualities found in the two breeds mixed. 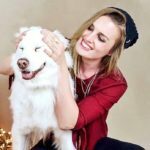 This is the procedure which has led to the creation of this Husky and Golden Retriever mix – a loyal dog known to be incredibly friendly and easy to train, as well as full of energy and strength. It supposedly has the best of what both mixed-in cross breeds (Husky and Golden Retriever) have to offer, and while it is rumored that the original breeder’s sole goal was to create a loyal dog with piercing blue eyes and gorgeous golden coat – the experiment turned out to be quite successful in terms of both appearance and temperament. Finding a Golden Retriever mixed with Husky is still quite rare, and not something you come across every day, but people are slowly warming up to the idea of a Siberian Husky Golden Retriever mix; likely due to the combination of desirable traits conveniently packaged into one adorable looking Golden Husky dog. If you consider purchasing one, it is incredibly important to look around for a reputable breeder that knows what they are doing, and not some backyard breeder who does it mostly for the money. Option number two is a disaster waiting to happen, and you could end up with a Golden Retriever Husky mix Goberian puppy that doesn’t have the traits you were hoping for, and that might be prone to health issues and decreases. Always choose a reputable breeder, or what was cheap might quickly turn expensive with unexpected vet bills. The Golden Retriever; one of the breeds that make up the genetic composition of this Golden Husky mix, is a large-breed dog that got its name from its impressive ability to fetch and retrieve shot-down birds (such as ducks) during hunts without damaging it further. They have what is considered a “soft mouth,” which is why they can do this, it is easy to train your dog and have an instinctual love for water. It is a smart dog that has been used for decades as a reliable service dog, a hunting companion, as pet actors on TV and in movies (Air Bud, The Parent Trap, Full House, Homeward Bound etc. etc. ), as emotional support animals, circus performers and much more, due to their loyal nature, ability to be trained and their consistent mood as well as behavior. The Golden Retriever is a long-haired dog with a need for continuous grooming, and they have a thick undercoat that protects them from the elements and allows them to be out and about all year-round. It currently holds the 3rd place as the most popular family dog in the United States, which is far from surprising considering their gentle, loving and overly friendly temperament. A Siberian Husky is not for the inexperienced dog owner, as it is a loyal dog that requires mental and physical activation on a highly elevated level. A Husky that does not receive this will get bored and potentially destructive; with digging, barking and howling as results. If, however, given proper stimulation – the Siberian Husky is an impressive force to be reckoned with! Most owners find it close to impossible to tire them out, they are known to be escape artists, have a high prey drive and are both strong and agile. The Husky makes a great family pet as long as there is enough knowledge and effort to properly care for them. It is not a dog breed apt for beginners, due to their high intelligence and demanding needs for physical activity and discipline. Calming aid treats can also help to calm your pet. The Husky is a medium-sized dog that shed excessively throughout the year, and they are also very independent and perfectly capable to care for themselves. They do best in a pack (with one or several other dogs), however, and should not be left alone for too long. Spending time outdoors is perhaps what they enjoy the most, and their thick coat is there to protect them even on the coldest of days. Many people associate the Siberian Husky sled dog breed with snow, mushing and extreme climates, which is indeed what they were originally intended to, and they often prefer colder climates. They are great for pulling; be that sleds, small wagons or anything similar, as they have the strength and the capacity to pull their own weight and sometimes more. Watching sled dogs at work is a powerful experience, as it brings out the animal in the Siberian Husky, and shows a primitive side that some dog breeds seem to have lost. A Siberian Husky and Golden Retriever mix is a mix of two breeds, meaning there are no real guarantees for what Golden Husky puppies will grow up to look like. Some look more like their Retriever dog parents, and others look more like a Husky. What they all tend to have in common is pet hair – lots of it – and an adorable fluffiness which requires frequent brushing. They don’t seem to shed as much as a purebred Husky, though, and have reasonable grooming requirements despite their thick coat. As for size, a Husky Golden Retriever mix Goberian puppy can grow up to be anything from medium-sized to large, since it is a mix of one large- and one medium-sized breed. It is again difficult to know for sure here, and while the size of the Goberian dog parents can give a general idea – genetics is a complex science with a lot more to it. Knowing what a Golden Retriever mixed with Husky will end up looking like or setting a standard for what they look like is close to impossible at this point, as with all mixed breed dogs, and the reason for their increased popularity probably has more to do with temperament and behavioral traits, rather than physical attributes. You might end up with what the original “breeder” is said to have had in mind – a golden dog with bright blue eyes, or you might get a Husky-like dog with longer pet hair and tipped over ears. Even Golden Retriever and Husky mix puppies from the same litter are bound to grow up looking different, as they could potentially inherit different physical aspects from their parents. Some have that Husky look with the erect ears and multi-colored coats, while others look like pup-friendly chew toys with big and vividly colored eyes. You never really know what you are going to get. All you really know is that your new Goberian puppy will be an irresistibly cute and fluffy dog with long and strong legs, large eyes and fur that protects them from the cold. He or she might look more like a Golden Retriever, or a Husky, but the traits will all be in there, and it is just a matter of which genes are dominant, and which ones are not (recessive). The Husky mixed with a Golden retriever gives you a tough Goberian dog that is great for outdoor fun such as hiking in difficult terrain, running, skiing and other canine activities, and they will make a perfect partner for someone who shares these interests, but who also enjoys downtime on the couch once you are done for the day. For many, the surprise element is part of the charm, and not knowing what the Goberian dog will look like physically once grown up can be quite exciting! And hey, let’s face it, there are few things as dangerously cute as a Golden Retriever Husky puppy! This is where it gets interesting, and why the mix has caught the attention of people in the dog breeding business as well as that of potential buyers. The Golden and Husky mix often come out is a perfectly balanced combination of the two breeds used; with the friendliness, the gentle way of being and the love for people and children of the Golden Retriever – cleverly mixed in with the drive and adventure lust of the Husky. Some compare it to a Golden Retriever after having had an energy drink (strictly hypothetical comparison, of course), or a Golden Retriever mentality where you have added a bit of independence, physical strength, stubbornness and ability to adapt to new and difficult terrain. As mentioned above, the Golden Husky mix is generally great with children, loving towards people in general and a wonderful family dog for the right family. Many enjoy cuddling and are gentle when playing, and while they can be a little protective of their family members if finding a situation threatening – they are usually good with strangers and new people. Husky and Retriever cross breeds get their protective side from their Husky parent, but it is usually contained and only ever shows if they feel like you are in danger. Just like the purebred Husky and most Husky mixes – the Goberian (Golden Retriever Siberian Husky mix) can be somewhat rebellious at times and go their own way rather than the way you had intended for them to go. The stubbornness is a trait that comes with the package no matter what, and while it can be charming they do need an owner who can keep them in line so that they don’t hurt themselves. They might require a bit of dog training or house training before they can be trusted off-leash since both the Husky and the Golden Retriever are known and prone to roam around. 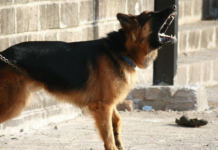 These fantastic dog training books can help! Overall, this Retriever Husky mix is as intelligent as a Husky, as goodhearted and kind as a Golden Retriever, a great watchdog and a loyal pup that has a tendency to bond more with one family member than with the others (even though, in most cases, it is barely noticeable). 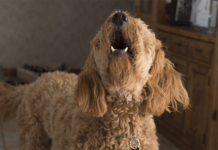 A Goberian dog is an ultimate dog for a loving and adventurous family that likes to be on the go, and that is aware of what it means to have a high-energy dog living under their roof. This Golden Husky mix has proven to – in most cases – inherit the Golden’s incredibly gentle ways and loving approach to people, which does make it a great option for families with kids. It is also a great excuse to get kids away from the TV and away from any other electronic device, by teaching them from an early age that dogs, whether they are designer dogs or not, need to be walked every day. Who knows, the kids might even believe it if you tell them that their new furry friend is a wolf Golden Retriever mix since many of these mixes have a somewhat wolf-like appearance. This does not apply to all of them though, as some grow up looking like big and fluffy teddy bears! As with all active dogs, Siberian Husky and Golden Retriver Mixed Breed dogs should preferably never be left alone with young children, as accidents can happen even with the sweetest of mixed breed dogs. Funny as it is, it is usually young children that needs to be supervised when around a dog, rather than the other way around, but it is good to make a habit out of never allowing small kids to play unsupervised with the family dog, especially when it is a bigger dog since dogs aren’t always aware of their size and weight. 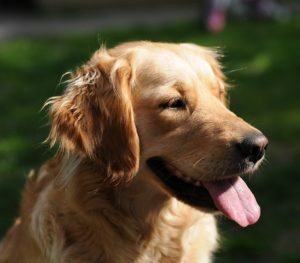 The Golden Retriever breed is known to be susceptible to some types of cancer, such as Hemangiosarcoma and Lymphoma, which unfortunately means that it is something that also runs in the family of a Goberian, putting them at a certain risk. The risk seems to be lower than for the purebred Golden Retriever breed, however, even if this has not yet been proven scientifically. Both parent breeds are prone to joint problems like hips and elbows dysplasia, elbow joint dysplasia, which is something that usually sets in at a senior dog age with leg pain, limping and stiffness as a result, and it is important to start preventing this as early as possible with supplements such as Glucosamine, Chondroitin and Omega 3 and 6. Goberians may benefit from a joint supplement such as Extend joint care. Conditions like Corneal Dystrophy, Juvenile Cataracts, and Progressive Retinal Atrophy can all be passed down from the Husky parent, as they are known to have genetic eye defects. None of this would be considered dangerous or life-threatening but could in the worst-case scenario lead to blindness. 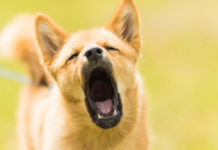 These potential health conditions like hip dysplasia or other joint dysplasia conditions could occur, just like they might in a purebred Golden Retriever or Husky, but it is not more likely to occur than in other dog breeds and mixes. All dog breeds are prone to some health issues, and while it is something to be aware of – the Goberian, or the Golden and Husky dog, is considered a healthy and strong designer breed that is less prone to life-threatening and concerning health conditions than many other types of active dogs. To lessen the risk of health conditions and to keep your Husky Golden Retriever fit, happy and healthy, you need to make sure that he or she gets proper nutrition throughout his/her life. Only feed high-quality kibble or dog food for huskies with a high protein content and do your research regarding which dog food brands can be trusted and which ones should be left on the shelf. 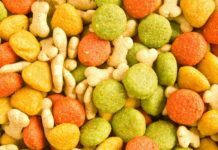 As a general rule; cheap grocery store dog food usually isn’t the best option for any pup, and you want to make sure that you are feeding quality ingredients to your Golden Siberian Husky all the way from the start. You could also try Golden Retriever dog food. Exercise is also key when it comes to keeping your pup at maximal health, so adapt this to your dog’s individual needs to assure that he or she stays at a recommended weight level and builds muscle. A healthy weight does miracles for any dog, and with one as active as these Siberian Husky and Golden cross breeds – it shouldn’t be too hard as long as you give them the opportunity to walk, run and play on a daily basis. If concerned about your dog’s health – schedule an appointment with your local veterinarian and see what they have to say. All dogs, regardless of breed, should be regularly examined and checked by a licensed veterinarian, to make sure no potential health issue go by unnoticed. In the meantime; do your best to prevent problems with a healthy diet and exercise. These Retriever Husky mixes go by many names; such as Goberians, Golden Huskies, Goberian Husky, Husky Retriever and much more, and it is not a dog for someone who is just hoping to obtain a fluffy and soft friend to hang around the house and sit on the couch with. 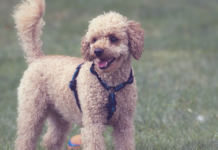 This is a smart dog that loves to spend time with its family, but that prefers to spend that time outdoors on exciting walks, hikes, and adventures. You will need to get them physically and mentally tired before they will enjoy sitting and watching TV with you, but they are not quite as extreme as the purebred Siberian Husky. Another thing to consider is the time you have to spend with your Golden Retriever Husky mix, since this designer breed loves to spend time with its family, and he or she won’t be happy if left alone for too long. So, if you work all day and plan to leave your pup at home, this might not be the most perfect fit for you. Also keep in mind that this Golden Retriever mix with Husky isn’t ideal for apartment living conditions, as they need space to roam around. This, of course, depends on how much time you have for activating your dog outside the home, so it is not a rule but more of a suggestion and something to consider. If, however, you have enough time to dedicate to an adorable Husky Golden Retriever, if you are active and enjoy being outside, then this could be the ultimate dog for you! They have the perfect combination of the Husky’s drive and personality, and the Golden Retriever’s soft ways and kindred spirit. It is a smart dog that will stay loyal to you for as long as it lives, and you will walk by your side for as long as you let it.